After 3.5 years of travel, the Japanese mission arrived 20 km from the asteroid Ryugu. CNES is taking part in the adventure with the little robot Mascot who will analyse its surface: explanations on this success and conversation with Francis Rocard, programme manager of the solar system exploration at CNES. The "peregrine falcon" (Hayabusa) has reached its destination! More than 280 million kilometres from the Earth, the Japanese spacecraft has passed its last phase of optical navigation to get as close as 20 km from the asteroid Ryugu this Wednesday, 27 June 2018. "Whenever we arrive close to an asteroid or a celestial body that has never been explored, there is a phase of surprise and expectation, F. Rocard praises. We count as many as 800 000 asteroids to date. Those objects are incredibly diverse, with very different sizes and densities. During the approach phase, we rapidly make discoveries as the resolution of the images increases.” Ryugu was no exception, with its 900 m in diameter, its rotation every 7 hours and 36 minutes and its peculiar topography with its bulgy equator that the scientific teams on the ground are beginning to decipher: like the other 13 asteroids which were overflown or orbited by the probes from different agencies before him, this asteroid is unique! The Hayabusa2 mission left the Earth on 3 December 2014, and flew over it exactly one year later to gain speed thanks to the gravitational slingshot effect. The probe then chased the asteroid 1999 JU3, renamed Ryugu on 28 September 2015. Despite its weight of only 609 kg, it slowly moved closer to its target using only 24 kg of fuel for its trip, thanks to its four ionic electric thrusters. Now that it has reached its target, it will stay 18 months around Ryugu, continuing to get as close as 5 km from the surface in July, then even closer (1 km) in August for a precise gravity measurement and therefore of the internal density of the asteroid, thus becoming a first of a kind study. "Ryugu is part of the family of type C asteroids, carbonaceous and probably hydrated, F. Rocard says. Consequently, there is an interest in understanding the origin of carbon and water on Earth but also in studying the chemistry of carbon during the formation of our Solar System." "Mascot is much smaller than Philae, it weighs only about 10 kg, 10 times less than its eldest! However, it is true that there is an obvious kinship through experience feedback: CNES is in charge of the same elements, namely batteries, signal transmission, release preparation. And the Germans asked us to have the Space Astrophysical Institute produce the miniaturised instrument MicrOmega; a real challenge, which will allow to analyse the absorption spectra at the surface and to understand the mineralogical composition of grains on the surface of Ryugu. To do this, we need to go back a little bit: in previous remote overflights, the mineralogical signature of the surface of the asteroids was "disappointing" several times because we did not find the composition information we expected. This is due to what the English call the Weathering Effect, namely the alteration of the first layers on the surface of the asteroid, subjected for millions of years to UV and solar wind and extreme temperatures. Thanks to Mascot and the MicrOmega instrument, we will be able to do these same measurements at ground level, which has never been done. Mascot has a very special functioning because it's a simple cube. It will land on the surface, bounce several times because of the very low gravity of the asteroid, and then move with an internal gyro wheel that is at the heart of its functioning. Once the measurements are transmitted to the probe, Mascot will use this same gyroscopic wheel to make an uncontrolled jump! The method is actually quite simple: the rapid rotation of the wheel is abruptly stopped by a brake. Physics does the rest: the inertial force makes Mascot take off. We hope to make 2 to 3 jumps on Ryugu’s surface." Hayabusa2 is therefore a mission that will provide new data thanks to its remote instruments on the comet’s surface and thanks to the materials sampled. A variety of techniques that would address a possible problem on one of the components but which also allows a wealth of analysis with laboratory analysis equipment that will be able to use these grains of matter in the coming years... Whereas some of the samples will be kept for future generations when new methods of analysis will emerge. In the meantime, Japanese teams are already at work studying the surface, identifying the most interesting collection and landing sites. As F. Rocard points out: "The next observations are crucial and three months will not be too much to make these decisions!" Also: follow the real-time development of this mission on the JAXA website. 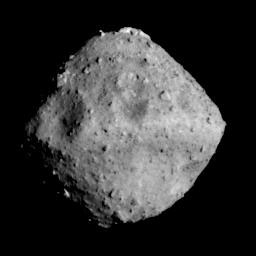 The asteroid Ryugu, photographed 40 km away on 24 June 2018.